Sustainability; E-Commerce; Accessibility & Convenience; Food Safety; and Automation & Digitisation were five key trends represented in the innovation on show at the recent Pack Expo International. PKN takes a closer look at what qualified this show to be called 'the main event' on the packaging exhibition circuit this year. Hailed as the biggest show in its history, Pack Expo International, held in Chicago in October, drew over 50,000 packaging professionals to view the wares of over 2500 exhibitors, among them a sprinkling of Australian companies. At a show of this size – 1.2 million net square feet of exhibition space to be precise – it’s nigh on impossible to walk every aisle, never mind stop at every exhibit in four short days. But I got around to a fair few and spent time observing the key messaging on display and listening to conversations in passing, to arrive at what I believe to be the top trends that capture the essence of Pack Expo 2018. As an aside, the trends identified are not listed in order of importance, and it’s also worth noting that some of the innovation referenced fits more than one trend. With the world’s plastic waste issue a hot topic, combined with the challenges of excessive food waste and limited energy resources, it’s not surprising that sustainability was a prevalent trend. Exhibitors showcased a range of solutions designed to meet brand owners’ sustainability commitments and tap into the move towards a regenerative circular economy. These include packaging and machinery design that enables significant reduction in material usage and production waste; materials that are recycle-ready or compostable/ biodegradable, and the development of reusable primary packaging. FreshCo had some striking consumer profiling displays on its stand. One example was Sustainable Stacy who is “loyal to brands with sustainability commitments, dislikes excessive packaging and is likely to purchase products in packaging that extends shelf life, minimises environmental impact and supports a regenerative circular economy”. At Be Green Packaging’s stand, PKN spoke to Michael Newhouse, director of marketing, about the company’s moulded fibre packaging solutions made from a mixture of renewable materials (bamboo and bagasse) that are compostable, recyclable and biodegradable. The trays can be made in any Pantone colour, and the moulded pulp surface is compatible with silk screen and laser inkjet printing, or a label. Be Green’s investment in proprietary engineering has resulted in a ‘zero draft angle’ solution, which means straight, no-slant sidewalls. 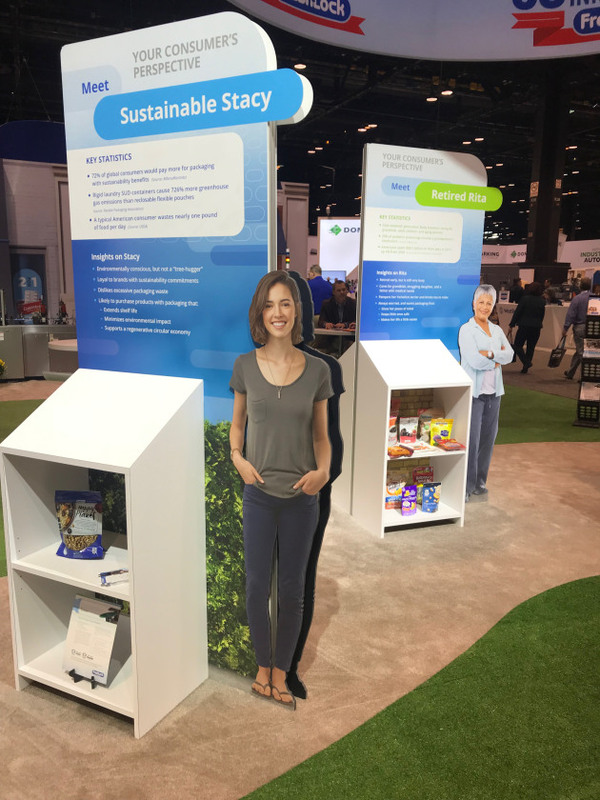 Sealed Air was putting its green foot forward too, and among the numerous products showcased on its verdant patch, a standout for me, given the growing importance of packaging solutions to prevent food waste, was TempGuard (pictured below). Pam Alexander, VP and GM for Integrated Fabrication, Sealed Air Corporation, talked me through the features. The Sealed Air TempGuard insulated liners, she says, were tested to pass ISTA 7E standards to ensure contents maintain proper temperature in the supply chain. Insulating products against temperature abuse, this solution is well suited to the meal kit delivery sector, and she says customers are excited by it because it is 100 per cent kerbside recyclable (liners are made from kraft paper and paper fibres). The flexible material conforms to contents, which Alexander points out means that the customer can reduce the size of the external cartons and, it follows, reduce shipping costs. Also, the padded box liners cushion items and minimise damage during handling and transit. The liners are compatible with refrigerants ranging from gel packs to phase change materials. Another paper-based solution, and winner of a Dow 2018 Packaging Innovation Award, presented at gala event during Pack Expo, was from Seed Phytonutrients. This is the first brand to launch a shower-safe paper bottle made completely from 100 per cent post-consumer recycled paper. A source-reduced inner plastic bottle is also made from 100 per cent post-consumer recycled plastic and contains 60 per cent less plastic than a comparable size rigid container. The container contains a small seed sachet inside to add to the overall consumer experience. Read the full report covering all five trends here in PKN's November-December 2018 issue.